Each year, fewer and fewer customers line up for traditional full-size American cars. These rear wheel drive behemoths are being replaced in the public's affections by a new breed of smaller, lighter, more fuelÐefficient cars. Most people think these time-honored all-American sedans are on their way out. Chrysler and GM certainly do. It's been years since the former has built any body-on-frame passenger cars, and this year will mark the end of production for the Chevrolet Caprice, Buick Roadmaster and Cadillac Fleetwood, the General's final entries in this class. Which leaves Ford Crown Victoria and the Mercury Grand Marquis as sole occupants of a dwindling market. However, there are people who still appreciate cars like these. Taxi fleets and government agencies, for example. Body-on-frame construction, which entails separate sub-construction for the chassis and body with the two mated in final assembly, is generally heavier and better suited to taking a beating than the near-universal unitbody approach. That's why most trucks and sport-utilities are still body-on-frame designs. Custom coachbuilders like separate frames because they can stretch them easily. Police forces like the high-mileage reliability of rear wheel drive powertrains, a roomy back seat for passengers likely to be wearing handcuffs and a big trunk for emergency gear. And large families still enjoy filling that large trunk with luggage and setting out, six at a time, on long trips. Ford figures that's a big enough market to warrant continued production of Marquis and Vic, and to make continual improvements to them. Given the appeal of the current cars and the ever-dwindling number of competitors, they're probably right. Nobody will mistake the Grand Marquis for, say, a Sable. This is a conservative design, one that doesn't use styling tricks to disguise its length or layout. The long hood lets everyone know there's a large engine inside, mounted longitudinally and driving the rear wheels as God and Henry Ford intended. The roofline suggests that there's plenty of interior space, as do the four large doors, and considerable rear overhang promises a large luggage bay. But the Marquis, and its Ford Crown Victoria twin, aren't throwbacks in every respect. Attention paid to aerodynamics–every drop of fuel counts in the big-car class, and so does elimination of wind noise–has given them a pleasing, rounded shape that can only be called elegant. Large wheel openings and understated side sculpturing contributes to their lithe and slightly muscular profile. Principal differences between Marquis and Crown Vic are confined to the cars' front ends. Mercury gives its version a more formal appearance with an upright grille and rectangular headlamps; the Vic is more contemporary; rounded lamp clusters and a smaller grille see to that. Designers of both have incorporated enough bright trim to please customers who equate chrome with class, and have done a good job of it. Ford has expended considerable effort on improving quality, and these cars show it. Paint and panel fit are excellent, as good or better than you'd expect for the price. Harder to see are external differences between base–Crown Victoria and Grand Marquis GS–and uplevel–LX and LS, respectively–models. The pricier versions ride on aluminum wheels (versus steel rims with covers on the base cars) and have different badges; other differences are found inside. Space, acres and acres of it, is the big plus for the Grand Marquis. There's plenty of stretch-out room inside, no matter whether you're sitting in front or back. Granted, the passenger in the center of the front bench seat has to share accommodations with the transmission tunnel but even that position offers more comfort than in some subcompact cars. The instrument panel was redone two years ago, along with the rest of the cabin. It carries the basic dials in traditional or optional electronic digital form, plus controls for the standard air conditioning system and radio. All knobs are laid out sensibly and are located for easy access. Basic versions carry most of the power assists and convenience features customers demand. 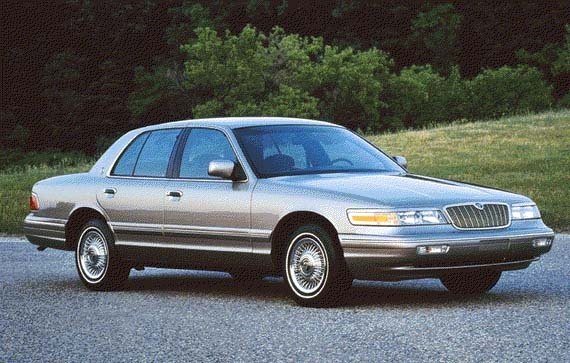 Aside from air conditioning and the basic–but good–AM/FM radio, power windows and mirrors are supplied with every Marquis and Crown Vic, along with nice details such as heat ducts to the rear seat area, automatic on/off headlights, illuminated window and door lock buttons, tilt steering wheel, grab handles for front and rear passengers and a driver's footrest. That doesn't mean that a host of upgrades aren't available. Upholstery (cloth) and carpeting are improved in the step up from base to LS/LX, as is the driver's half of the front seat, which gets power adjustments. But the real attraction of LS and LX lies in the availability of some desireable options (desireable in terms of both quantity and quality) not offered in the less-expensive versions. Many are available on a stand-alone basis–leather seats, remote keyless entry and two more versatile sound systems, for example–but most are incorporated into option groups that bring together popular extras for less than the total of their individual prices, a common practice that pays off for manufacturer and consumer both. Our Grand Marquis LS test car had almost all of them. One combined power door locks with cruise control and illuminated entry; another had some desireable chassis options, power adjustments for both sides of the front seat, electronic instruments (which we could have done without), electronic temperature control for the air conditioning system and remote keyless entry. The emphasis is on luxury, and it pays off. Marquis and Crown Vic, properly equipped, rival some much more expensive cars in the way they coddle their occupants. That's a tradition worth sustaining. Banish fears of piloting the 4-wheeled equivalent of a supertanker. Though the Marquis is almost 18 in. longer than a Sable, light but reasonably precise steering and the visibility provided by lots of glass make herding it through traffic a cinch. It's a quiet car, too. The separate frame contributes to isolation from road noise you just won't find in many other cars. Good sound insulation does the rest. The Marquis rides softly, as befits a traditional passenger sedan. It's at its best when the optional Handling and Performance Package–which includes heavy-duty springs, shock absorbers and antiroll bars, a shorter rear axle ratio for faster acceleration, rear air suspension and a dual exhaust system that raises the standard 4.8-liter V8's output by 20 hp–is installed. This is essentially the same equipment that goes with the police package, and ride quality deteriorates so little with this option that we'd recommend it to all buyers. Performance is good. Brisk acceleration is combined with better than expected fuel economy, and enough power is available to make passing and hill-climbing easy. New for the 1996 Marquis and Crown Vic is a natural gas fuel option (NGV), the first of its type in a passenger car built by a major manufacturer. Slight modifications to the engine and special reinforced fuel tanks are required to transform the Marquis into an ultra low-emission vehicle. NGV versions are built using the reinforced frame and heavy-duty suspension from the police package. Besides its low-emissions benefits, the clean-burning properties of natural gas make it kind to engines, and performance is virtually the same as gasoline. The main drawback is a somewhat shorter fuel range. Grand Marquis and Crown Victoria represent value. Whether rated by size or content, they are worth every dollar Ford charges for them. Yes, most people will find their needs met by smaller sedans or minivans. But for fleet customers and individuals looking for maximum space in a solid, reliable 4-door package, we think it's a good idea to check out the last of the big-time cruisers.